This is the love story of a friend of mine and her husband, who was also a friend of mine in college. Today marks 2 years since he was KIA, and his wife and their daughter are still living their lives without him as the rest of world spins unaware. I think of them often, but especially during the month of April which holds their wedding anniversary, and his angelversary. This is a piece she wrote a while back that I've since read multiple times (and not once gotten through without shedding a tear). I want to share it with everyone I can, so that we can all be appreciative of the sacrifice some families make for this country. This is a story about young love. One that is heart-wrenching and sobering. This is a story about the price of war. James and I never had the classic love story. From the moment we met my freshman year of college in 2001, it was like we tried to do whatever we could to push each other's buttons. From the outside looking in, most people assumed we would never work out. And we didn't most days. For the first five years we went through periods of loving each other to despising each other. We'd break up, date someone else, and get back together every time. Maybe it was our extremely stubborn and sarcastic personalities, maybe it was that we both thought we should be with someone different, maybe it was just being young. But like I said, we always ended up back together. One of my favorite things James ever said to me (outside of "I love you" and "Will you marry me?") was when he tried to explain our relationship to me. His exact words were "No matter how hard we try to get rid of each other, we always end up back together. It's like it's written in the stars and it's meant to be." After he said that line, we never broke up again. When I graduated from Drake in 2005 with a degree in Creative Advertising, I knew I was never going to move to some big city and work at the fancy advertising firm I had always pictured in my mind. I knew that my place was with him, in Iowa. I would find a job that I enjoyed, probably in the insurance world, and watch him work his way through the military ranks. I was so proud of who he was and what he was doing for our country. In early 2007, after returning home from Iraq in late 2006, James and I found out we were expecting. We were extremely excited and super nervous. He told me continuously that "it better be a boy" because he couldn't handle a girl. He was the typical soldier loving everything "manly" and knowing nothing about the fun that pink, glitter and sparkles bring. Needless to say, in December '07, we welcomed our little bundle of joy ...wrapped in pink! Caydence Lillian might not have been the boy he wanted, but she definitely had her daddy wrapped around her finger within a matter of moments. She was always his greatest accomplishment. A year and a half seemed to rush by, and in April 2009, James and I finally tied the knot in front of a small group of friends and family and of course, our screaming little girl. People always ask why we waited so long, and we both gave the same answer – “we had to figure out if we liked each other.” He was never a man of many words (until he was drinking), having him send flowers was like pulling teeth and romance was never a major player in our relationship. For example, on my 27th birthday, him and his friend surprised me by setting up a romantic meal of MREs and shot glasses. That was my man, a jokester. He was also an amazing friend who could always be counted on whether helping someone move or just to give them a smile. Oh, that smile. It made my heart melt every time. Anytime he was in trouble, he would flash it and say “I loooooooove you sweetie” and sure enough, I’d cave in. His daddy skills were second to none as well. He never flinched at a dirty diaper or hesitated to play dress-up with Caydence. I’d come home from work a lot of evenings to find those two fully immersed in a Disney princess movie or covered in makeup. Fast forward almost two years. 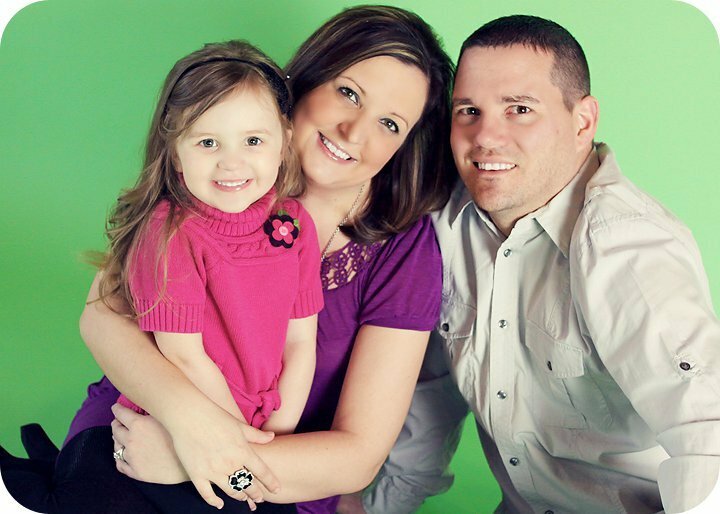 James’ unit had deployed in mid-2010, but because of a back injury incurred in Iraq, he stayed behind. I was not at all upset by this, but like most soldiers, it irritated the heck out of him. He was bound and determined to be a part of the Replacement Battalion that would deploy in early 2011, but I doubted his ability to get medically cleared to leave. I learned my lesson. At the end of January, I received a call at work, from him, telling me that he had received the go-ahead to deploy and would be leaving in the next few weeks. I was shocked. Then angry. Then sad. Then so worried. I cried at my desk for about an hour before my boss told me to go home. I didn’t want to though because I didn’t want to see him. I was so angry that he purposely was leaving. I understood that he felt he needed to be there “for his guys” but I needed him there for us. Another thing bothering me was that we were supposed to leave for our first family vacation at the end of February. A family vacation that he would no longer be attending. On February 23rd, James dropped Caydence and me off at the Des Moines airport. His deployment date had been pushed back to the 28th but he wasn’t supposed to leave the state, meaning he couldn’t go on vacation with us anyway. It was a weird feeling knowing he was the one deploying, but was dropping us off at the airport—like something was completely backwards. Staying in true toddler form, when it was time to say our goodbyes, Caydence made a mad dash up the escalators for security. James and I quickly embraced and gave each other a quick kiss before I headed to catch up with the little one. I remember the slow ride up the escalator and watching the back of his head disappear out of sight thinking he never got to hug Caydence goodbye and that we had a crappy kiss. In the back of my mind though, I thought “he’ll be home in less than six months … no big deal.” If I would have known that was the last time I would see my husband alive, I would have ran back down the escalator, jumped in his arms and not have let go until someone pried me away from him. The morning of April 23rd was different than most mornings. It was the day before Easter and also my first big wedding of the season. Being a wedding photographer always puts butterflies in my stomach, and this wedding was no different. Some widows say they had a feeling something was wrong, I didn’t. I was more concerned with where my lenses and tripods were. I had talked to my husband three days prior and although he had told me he would call the night before, I didn’t think much of him not calling. I knew it was difficult to get a break and phone lines were long. I also figured with my luck, he’d call right in the middle of the ceremony and I’d miss him anyway. I never doubted he would call and I definitely never thought that while I was thinking of him on my hour drive to the wedding, he was already gone. Things started getting strange just before the ceremony started. My parents and sister were in town watching my daughter for me and when I glanced at my phone in-between photo setups, I noticed I had missed calls from both of them and they had left voicemails. I never checked my voicemail and they knew that, so why in the world would they be leaving one? They both said the same thing, “Caydence is sick. Call immediately.” Of course I called, but told them to bring her to the doctor. There was nothing I could do for her and I couldn’t just walk out of a wedding. I could tell in their voice that they wanted me home, but I just figured it was them not understanding that it was the most important day of someone’s life and I was being paid to capture it. After the ceremony was complete, I hopped in my vehicle to follow the bridal party to a bowling alley where they wanted to take photos. While driving, I called my sister. She said Caydence was feeling better but I should still get home as soon as I could when the photos were done. I had already told the bride and groom that I was heading out earlier than normal so that wasn’t an issue. The strange thing was that my sister kept asking where I was. My entire family is from Wisconsin, so me explaining where I was in Iowa seemed counterproductive, but I explained anyway. A few minutes from the bowling alley we hung up the phone with an “I’ll see you in a bit.” I saw them sooner than I thought. I had just pulled into the parking lot and was getting my equipment out of my bag. The wedding party was standing on the steps waiting for me to snap a few photos, when a vehicle flew into the parking lot. I remember glancing up, figuring it was some friends of the couple and went back to digging out lenses. It wasn’t until I noticed someone coming toward me out of the corner of my eye that I looked up. It was my dad. And he had tears in his eyes. Thoughts rushed into my head and all I could get out was “where is she?! ?” There was no reason they would drive and find me an hour away unless Caydence was extremely sick or worse. He shook his head “no” and said “It’s not her. The military was at your house.” Confusion. Why would the military know Caydence was sick? Why would they care? And then it hit me. James. The next few minutes were a blur. I remember dropping to my knees. I found out later that I had thrown my camera and purse into my car at the same time. My dad hugged me and I pushed him away. I just needed to breathe and to think and to …. Oh my God …. He couldn’t really be …..
During this exchange, the bridal party stood watching on the stairs not knowing what was occurring or who the man talking to me was. My mom walked over to them and introduced herself and told them that I needed to leave. The bride, who knew Caydence was “sick,” asked if that was the reason. My mom answered with a quick, “no it’s her husband.” They all understood right then. I had just had a conversation earlier in the day with the bride and groom about how hard deployments were and how not all women are made to be “military wives.” They understood well as he had been a member of the Iowa National Guard as well and had been deployed. I often think about how they must have felt at that moment. What was the happiest day of their life was the saddest day of mine. By the time we started the drive back to Des Moines, I was mess inside. I didn’t say much but I remember having thoughts fly back in forth in my mind. I knew he was either dead or missing. I debated in my head whether I would rather him be gone or have been captured. That is a thought no wife should ever have to have. I remember looking over at my daughter sitting happily in her car seat (who was definitely not sick) and thinking that I wanted to protect her from it all. I also remember looking down at the tiny yellow piece of paper that the two men had left with my dad. A Captain and a Chaplain. Just wonderful. Eventually it started again. But it wasn’t until after almost a full month of being surrounded by family and friends, signing countless papers, making extremely difficult decisions, being told by my casualty assistance officer that I needed to eat, taking sleeping pills to force me to get some sort of rest, and of course burying my husband. James had been killed in the early hours of April 23, 2011 in the Al-Sayad district of Kapisa Province in Afghanistan. His unit had just returned from a routine mission when they were called upon to help rescue and provide cover for the crew of a downed helicopter. I have heard several stories of that morning and they all sound like they were straight out of a movie. Guns, RPGs, mortars and helicopters everywhere. His unit was behind a wall when James was shot in the lower back and exited through his chest. His injuries were too much for him to overcome, and even though his medics and friends did all they could, nothing could save him. Another soldier was shot moments later, and luckily, his outcome was much more favorable. James’ body returned to U.S. soil on April 26th allow with two young marines who had both been killed by roadside bombs. I arrived at Dover Air Base in a bus full of their families. The Army, unlike the Marines, only allows three members of the family to come to what is called a “Dignified Transfer.” I watched in silence as the sisters of one of the fallen marines bawled. I understood her pain, but felt like I was trapped inside myself. It wasn’t until I saw the metal container, draped in the U.S. flag, which was carrying his body, that I completely lost it. The floodgates had finally opened. How could the strongest man I know be laying lifeless in that box? Almost a week later, when the autopsy was complete and paperwork filed, he finally returned home to Iowa. I still hadn’t seen him when the jet landed at the Des Moines airport. Military officials allowed me and his parents to go touch his casket, but quickly loaded him into the motorcycle Hearst that would drive him the 98 miles to Manning, Iowa. He was escorted on that sunny Monday morning by about one hundred Patriot and Freedom Riders and hundreds of supporters lining the route. Most held flags or signs and some saluted. It was definitely a sight to behold. The morning of the visitation, I arrived at the funeral home at 9am. I had an hour scheduled for “my time” with James before the rest of his family would arrive. I had made the decision that I didn’t want Caydence to see him or remember him that way. When I walked into the memorial room, I instantly recognized the profile of his face. My heart dropped, for the past week I had been convincing myself that there must have been a mistake. That it wasn’t going to be him in that coffin. Sure enough, I was wrong. I searched over every inch of his face, taking in the little scar over his eyebrow, the slight stubble on his chin and his perfect cheekbones. I felt broken all over again. I reached out for his hand—wanting just to hold it and have his fingers wrap around mine. Instead, they felt like concrete. I was later told that the military medical examiners use double the amount of embalming fluid to preserve them longer since many are transported across the country. After having the funeral home remove his white “Michael Jackson” looking gloves, I slipped his replacement wedding ring on his finger. One last time. The visitation and funeral were attended by over 2,000 people—many of which never knew my husband, but felt the calling to come say goodbye to a hero. His burial at Arlington National Cemetery was much smaller but was attended by the Secretary of the State, the Secretary of Defense and the Secretary of the Army among others. Perhaps the most heartbreaking moment of all was watching our daughter received a flag and condolences from the Secretary of Defense. She held out her little three year old hands and cried little three year old tears, but I knew she didn’t really know what any of it meant. Someday though, she will understand the sacrifices her dad and thousands of others made to preserve the freedoms that we enjoy and often take for granted. Someday she will understand that because of media coverage and the length of time our soldiers have been fighting, desensitization runs rampant among our population. Someday, she might be angry and feel like her dad’s death was in vain. But as her mother, I hope that someday, she will know our love story. Someday, she’ll know that even through pain and sacrifice, we will persevere and we can have our happy ending. It’s currently been almost 10 months. It feels like 10 years. I have gone through several stages of grief—I will go weeks without crying and then will sob for four days straight. I will suddenly become enraged over how my husband died or pissed at him for leaving us or frustrated that people around me think they understand. Sometimes it is just the lyrics of a song that trigger the waterworks. I listen to Caydence tell him goodnight every night and that she loves him. It always brings tears to my eyes. I’ve tried to tell myself that I need to move on, but I can’t stop searching for him in crowds or thinking his truck is going to pull into the driveway and he is going to step out. I am starting to realize that we will never celebrate another holiday or anniversary together. Instead, I will make trips out to visit him at Arlington and feel the tears pour from my eyes until that sense of peace rushes over me. It’s a strange feeling, but one of his friends says he feels the same thing when he is here. In typical “James style,” I don’t receive signs or “God-winks”; instead, I find myself tripping over a box of his in the basement and cussing at him. It might seem abnormal to some people, but to me, it’s totally us. I’ve been remodeling our house with my parents and trying to do all the things he wanted to get done. He loved this damn house, and I feel like it’s my job to keep going on all those projects he never got to finish (he was definitely known for his unfinished projects.) There is an entire little room in my basement that holds all of his things. I peak my head in there every time I do laundry. I have yet to escape without bawling. One upside has been that I have made some amazing friends since everything happened. My casualty assistance officer became my rock and answerer of all questions. Immediately, a few military wives from my area reached out offering me anything from food to childcare assistance. I knew that it must have been difficult for them, as their biggest fear was my reality, but they still stepped forward. I also found the support of military widows from across the country. They have been the most amazing support system and leaning post I could have imagined. Our common bond allows us to feel not quite so alone on this journey. Then of course, I had the friendship of those that had been there before James’ death. Those several people got me through my darkest of days. The uncertainty of things to come freaks me out. I hate that I can’t rewind a year, take a “mulligan” or simply ask someone to change the past. At the end of the day, I don’t know what my future holds, but I do know that someday I will see his amazing smile again. That will get me through today. Though I don't know Amanda I did know James. My heart breaks for her and her family. Many prayers go out to them today and every day. 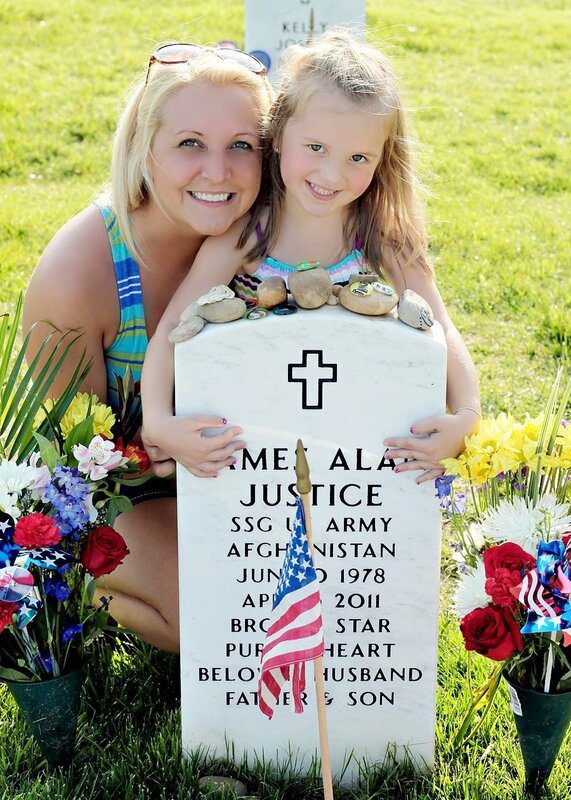 Thank you to the Justice family for your service and sacrifice. Thank you so much for sharing this. The sacrifices the men and women of the military AND their families make for us is so very humbling.